Juxtaposed atrial appendages defined as the two atrial appendages lying adjacent to each other on the same side of the great arteries instead of encircling their roots is reported in 0.28-1.1% of different pathological series.,, The initial classification of juxtaposition proposed by Dixon is based on its position in relation to the great arteries. If both appendages are positioned on the left side of the great arteries, then they are called as left juxtaposition. This entity is six times commoner than right juxtaposition, where both atrial appendages lie on the right side of great arteries., Dixon's classification is primarily based on the anatomical position of the two atrial appendages only and does not consider the morphology of atrial appendages. The classification proposed by VanPraagh is based on the morphology of the appendages., Whenever the morphological right atrial appendage, which is broad, triangular, and more trabeculated, is abnormally positioned above the thin slender fingerlike left atrial appendage, VanPraagh's classification will name this anomaly as juxtaposition of the right atrial appendage.­ This is commonly associated with significant cardiac anomalies in the heart, most commonly with transposition of great arteries. The other variant, namely juxtaposition of the left atrial appendages, is very rare and may be seen in structurally normal heart or with minor cardiac anomalies also. The morphological definition proposed by Van Praagh has the advantage over Dixon classification when it is applied to situs inversus and in heterotaxy syndromes.­ The images in this report demonstrate classical features of right and left juxtapositions and discuss their clinical relevance. 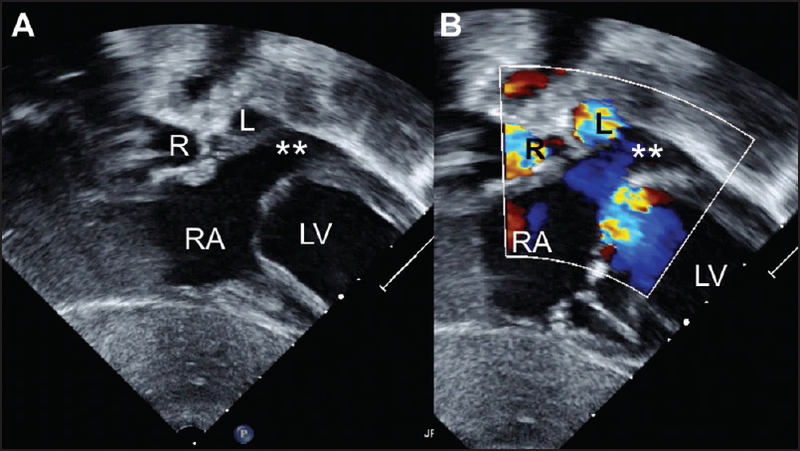 A one year old boy diagnosed with large ventricular septal defect and severe hyperkinetic pulmonary arterial hypertension had situs solitus with levocardia, D-looped ventricles, and normally related great arteries. He had right juxtaposition of the morphological left atrial appendage. 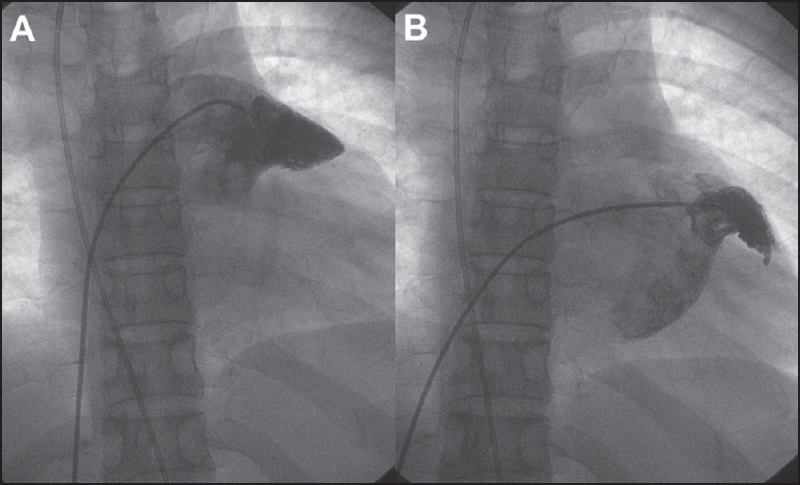 The juxtaposed left atrial appendage was lying superior to the right atrial appendage, which was cannulated for cardiopulmonary bypass [Figure 1]. The chest x-ray [Figure 2], echocardiography [Figure 3], Movie 1], and intraoperative transesophageal echocardiogram [Figure 4], Movie 2] showed the classical findings. The patient underwent uneventful surgical correction. A 3-year-old patient diagnosed to have situs solitus, tricuspid atresia, transposed great arteries, large nonrestrictive atrial and ventricular septal defects, and pulmonary stenosis underwent bidirectional Glenn shunt. His chest X-ray [Figure 2], echocardiogram [Figure 5], Movie 3], and angiogram [Figure 6], Movie 4] showed classical findings of left juxtaposition of morphological right atrial appendage. The prominent convex right atrial border in right juxtaposition and concave right atrial border in left juxtaposition on the chest X-ray offers the first clues to this anomaly  [Figure 2]. Prior identification has implications during cardiac catheterizations and surgery. In all hearts with atrial appendage juxtapositions, the juxtaposed atrial appendage always lies above the native atrial appendage. In the commoner left juxtaposition, the native left atrial appendage lies below the juxtaposed right atrial appendage. On the contrary, in right juxtaposition, the left atrial appendage lies above the right. If this is not recognized during cardiac surgery, the orifice of the juxtaposed atrial appendage may be mistaken for an atrial septal defect and it may be closed with a patch. In the echocardiographic images of patients with juxtaposition of atrial appendages, the plane of atrial septum in the anterior part is parallel to the anterior chest wall; but in the posterior part it is normally oriented. This horizontal orientation of the anterior atrial septum is the most diagnostic echocardiographic observation in this anomaly. Since the plane of the interatrial septum is different in these patients, occluder devices used to close secundum atrial septal defects that are located in the anterior portion of the atrial septum may have a different device orientation on echocardiography and fluoroscopy. Catheter entry into pulmonary veins by maneuvering a catheter through the atrial septal defect or patent foramen ovale will not be possible if the catheter or guidewire tip is positioned in the left juxtaposed right atrial appendage instead of the left atrium. Failure to identify position of an inflated septostomy catheter in the left juxtaposed right atrial appendage may lead to trauma to the base of the appendage during the balloon atrial septostomy for the transposition of great arteries, which is the commonest association of this anomaly. In this same anomaly, Blalock Hanlon septectomy is extremely difficult in the setting of juxtaposition due to anatomical smaller size of the right atrium. Mustard operation may also be technically challenging in this anomaly. Cannulations and venting during cardiopulmonary bypass and performance of surgeries such as senning surgery or lateral tunnel Fontan surgery can be planned well without on-table surprises with prior recognition of these juxtapositions. Even though right atrial to pulmonary artery Fontan surgeries are almost never performed nowadays, this anomaly used to pose significant difficulties in the past. In such instances, direct anastomosis was achieved from the juxtaposed morphological right atrial appendage to the left pulmonary artery. Van Praagh S, O'Sullivan J, Brili S, Van Praagh R. Juxtaposition of the morphologically left atrial appendage in solitus and inversus atria: A study of 18 postmortem cases. Am Heart J 1996;132:391-402. Van Praagh S, O'Sullivan J, Brili S, Van Praagh R. Juxtaposition of the morphologically right atrial appendage in solitus and inversus atria: A study of 35 postmortem cases. Am Heart J 1996;132:382-90. Lai WW, Ravishankar C, Gross RP, Kamenir SA, Lopez L, Nguyen KH, et al. Juxtaposition of the atrial appendages: A clinical series of 22 patients. Pediatr Cardiol 2001; 22:121-7. Dixon AS. Juxtaposition of the atrial appendages: Two cases of an unusual congenital cardiac deformity. Br Heart J 1954;16:153-64. Becker AE, Becker MJ. Juxtaposition of atrial appendages associated with normally oriented ventricles and great arteries. Circulation 1970;41:685-8. Frescura C, Thiene G. Juxtaposition of the atrial appendages. Cardiovasc Pathol 2012;21:169-79. Bream PR, Elliott LP, Bargeron LM Jr. Plain film findings of anatomically corrected malposition: Its association with juxtaposition of the atrial appendages and right aortic arch. Radiology 1978;126:589-95. Rice MJ, Seward JB, Hagler DJ, Edwards WD, Julsrud PR, Tajk AJ. 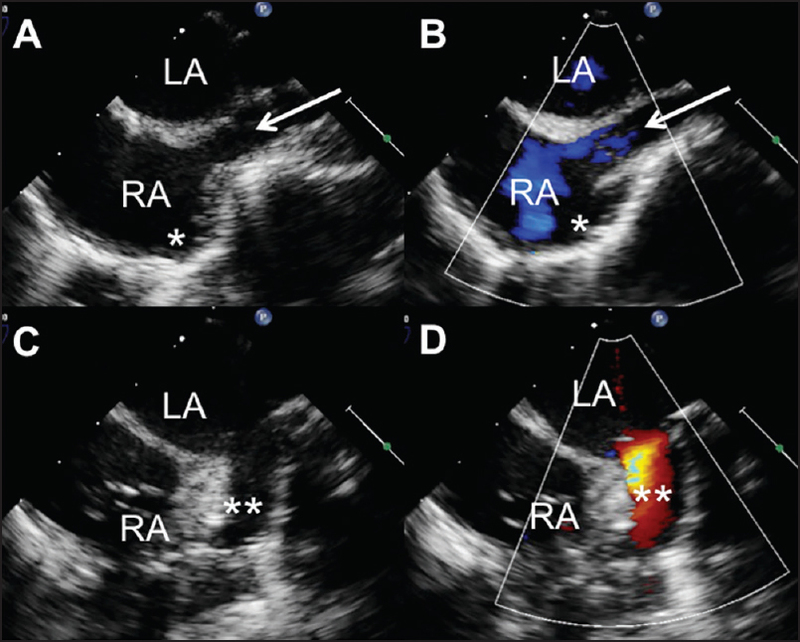 Left juxtaposed atrial appendages: Diagnostic two-dimensional echocardiographic features. J Am Coll Cardiol 1983;1:1330-6. Sivakumar K. Catheter closure of an atrial septal defect in anatomically corrected malposition with left juxtaposition of atrial appendages. Cardiol Young 2009;19:534-6. Tyrell MJ, Moes CA. 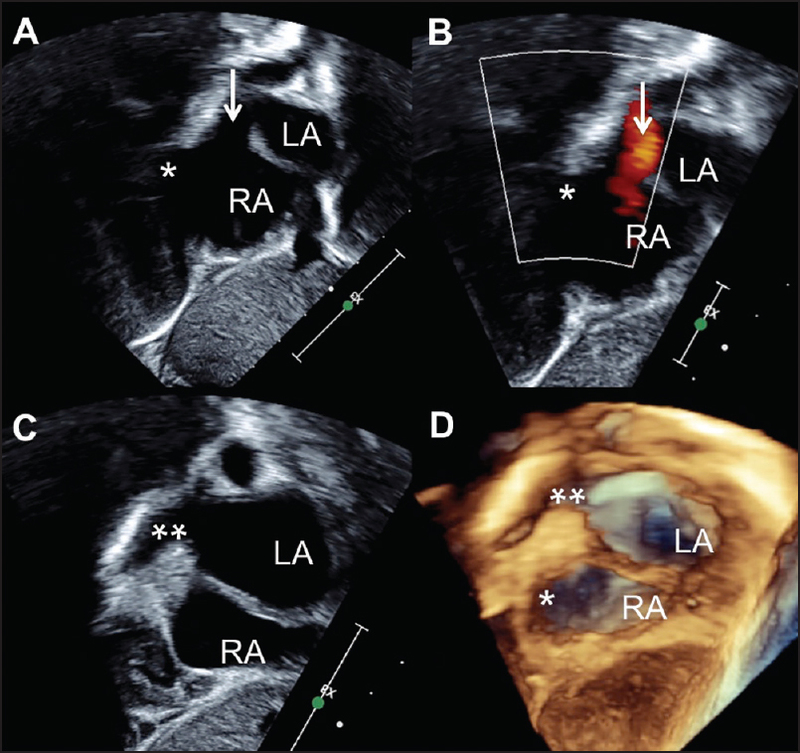 Congenital levoposition of the right atrial appendage. Its relevance to balloon septostomy. Am J Dis Child 1971;121:508-10. Rosenquist GC, Stark J, Taylor JF. Anatomical relationships in transposition of the great arteries: Juxtaposition of the atrial appendages. Ann Thorac Surg 1974;18:456-61. Vidne BA, Subramanian S. Complete correction of transposition of the great arteries with left juxtaposition of the atrial appendages. Thorax 1976;31:178-80. Deutsch V, Shem-Tov A, Yahini JH, Neufeld HN. Juxtaposition of atrial appendages: Angiocardiographic observations. Am J Cardiol 1974;34:240-4. 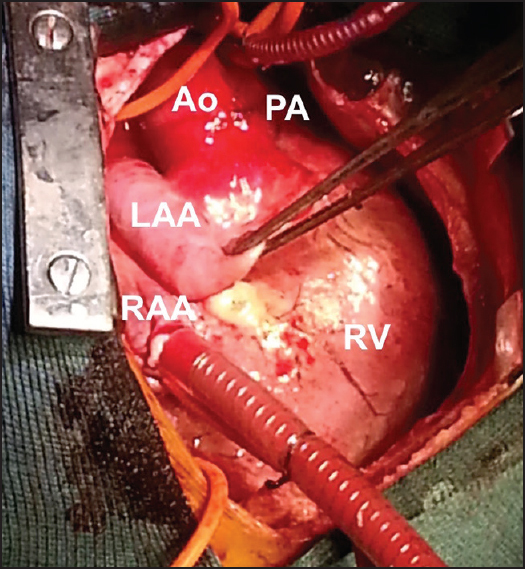 Kidani M, Noto T, Okamura H. Surgical repair of tricuspid atresia with juxtaposition of the atrial appendages, direct anastomosis of right atrial appendage to the pulmonary artery (author's transl). Kyobu Geka 1979;32:630-3.